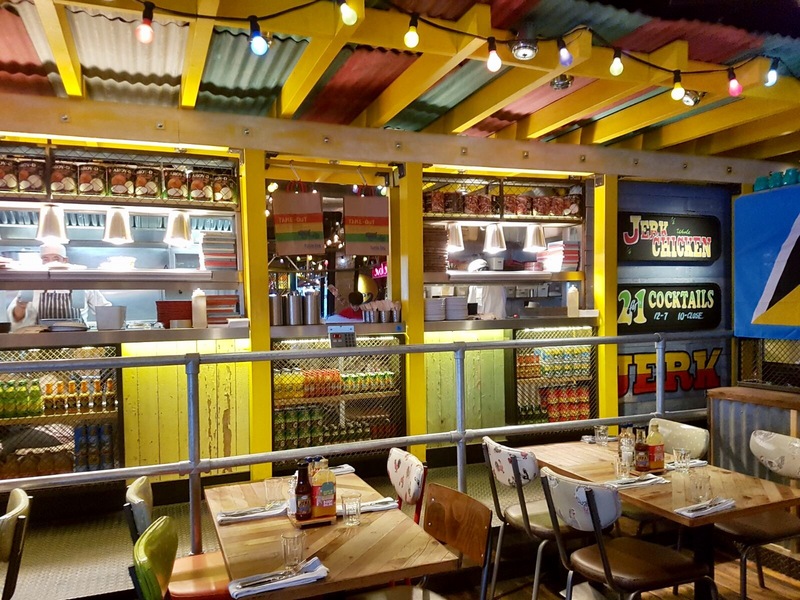 A few weeks ago when the fiance and I were in Cheltenham, we were lucky enough to be invited to review Turtle Bay, the new Caribbean restaurant that had just opened in the town centre of the regency town. 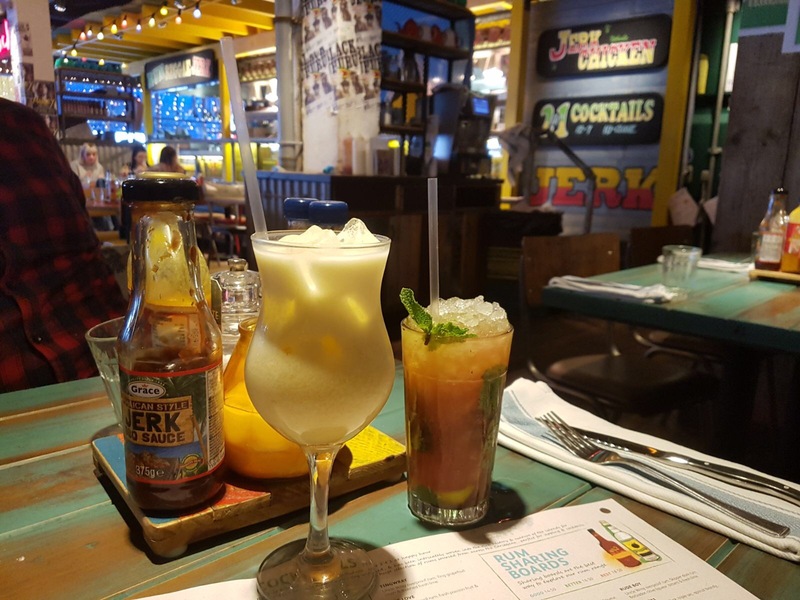 The fiance who visited the Caribbean a few years ago and fell in love with their spicy, flavoursome cuisine, had high hopes for our visit to Turtle Bay, and I’m pleased to say that he wasn’t disappointed, and neither was I. 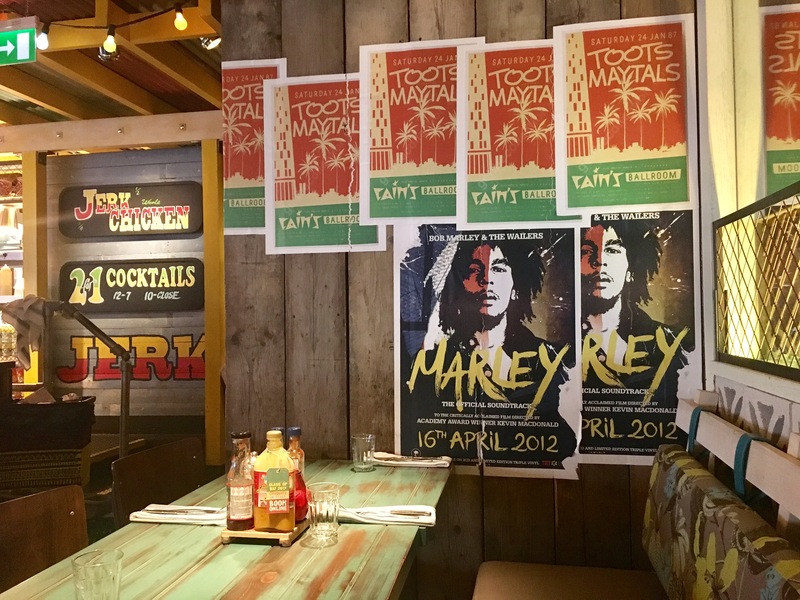 As we stepped through the door, I instantly fell in love the vibrancy of the restaurant; everywhere I looked there were bright, bold colours, patterns, and designs, many of which featured reggae legend, Bob Marley. Within under a minute of arriving at the restaurant, we were met by our server for the evening, Michael who was polite and wonderfully friendly, the rapport he created with us, as well as other diners, was incredible. We were shown to our table and given drinks menus to have a browse of. 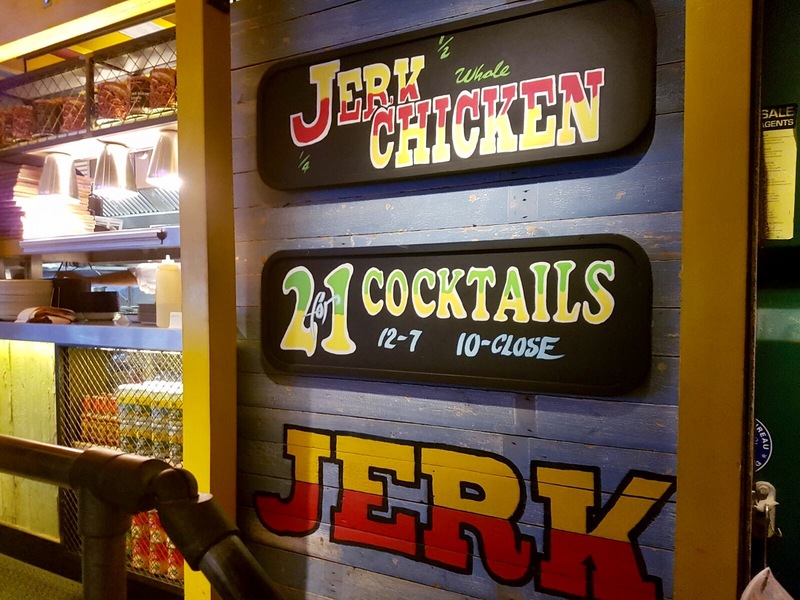 As I looked around the restaurant, I honestly felt like I was in the Caribbean; the colours, smells, and sounds created a truly authentic Caribbean experience. The room was filled with sweet, spicy scents, while the sounds of kettle drums and gentle reggae music played across the restaurant. As we sat waiting to order, the restaurant manager, Wesley came over and introduced himself and welcomed us to the restaurant. He made us feel relaxed and welcome. I decided to start off with a Koko Colada, Turtle Bay’s take on the classic Caribbean cocktail, Pina Colada. Made up of a combination of Koko Kanu coconut rum, dark rum, pineapple, coconut syrup, coconut cream, and nutmeg (which I asked to be left off because of my allergies), the Koko Colada really packs a punch. It’s fresh, fruity and creamy – if you love the taste of coconut, then you will love this. The fiance opted to start with the Marley Mojito, made up of a combination of Appleton Signature Rum, green melon liqueur, fresh mint, watermelon, and Turtle Bay ginger beer. This tasted wonderfully fresh, with a strong melon flavour followed by a subtle hint of ginger beer. While we sipped our cocktails, Michael came over with food menus and went through what was what with us. When I told him about my nut and peanut allergy he was fantastic, telling me what would be safe to eat, explaining that he would check with the chefs and put a note on the order, giving me extra peace of mind, which I truly appreciated. After a lot of umming and erring over what to have for a starter, I decided to start with the Garlic and Chilli Pit Prawns. 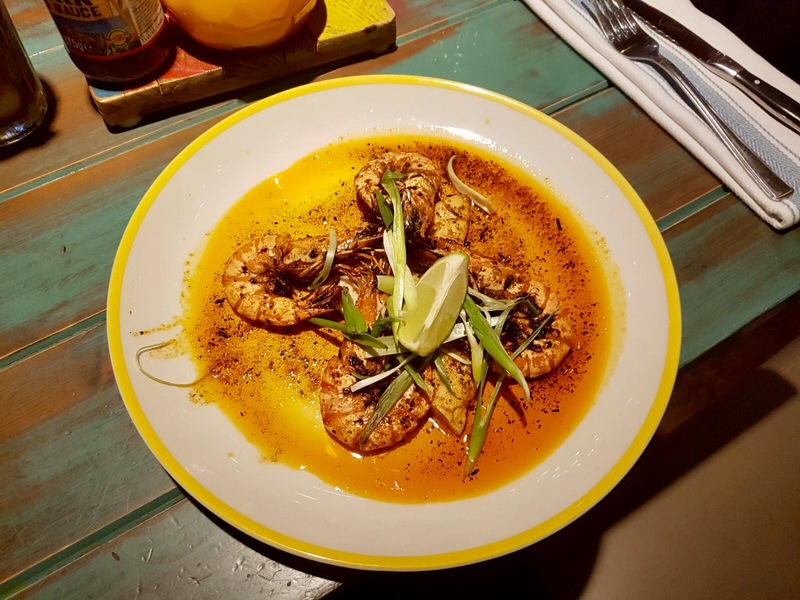 These whole shell-on prawns were grilled over the Turtle Bay jerk pit – basically an indoor BBQ pit – and tossed in herb and chilli and garlic butter, before being served with a roti flatbread. The entire dish was delicious. The prawns were wonderfully succulent and spicy, with the oils coming off of the butter soaking into the roti flatbread, infusing it with flavour. I absolutely loved the dish. 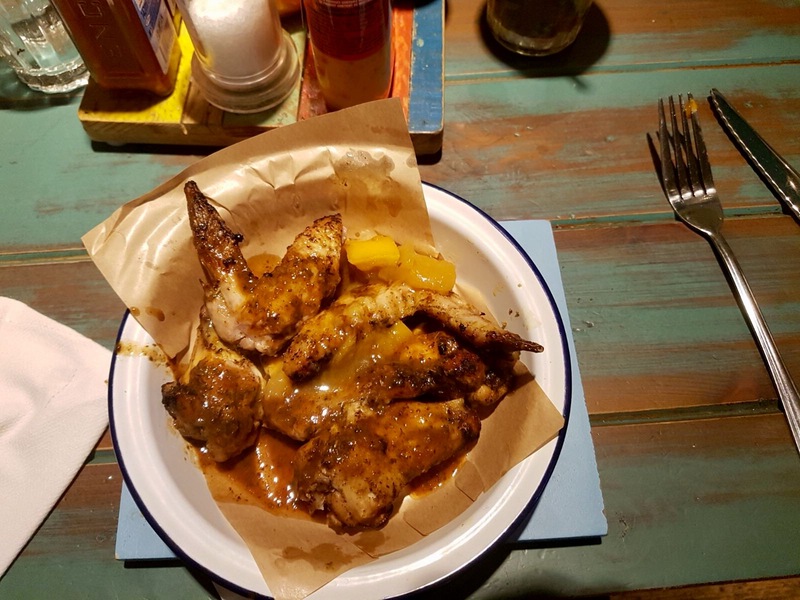 The fiance opted to start with Jerk Pit Wings that had been spiced and marinated for 24 hours, before being placed in the Jerk Pit and grilled with sour orange chutney, and glazed with classic jerk. There was the option of classic jerk glaze, pineapple or coconut, but being the jerk lover that he is, he opted for classic jerk. The Jerk Pit Wings were succulent, juicy and packed full of flavour, as the fiance plowed through them, the meat just slid off of the bone. After carefully studying the menu and being stuck between the Jerk Pit BBQ menu and the One Pot Menu, I opted for the Jerk Chicken which was marinated for 24 hours with classic jerk seasoning before being pit grilled and served with coconut rice ‘n’ peas, Caribbean slaw, sour orange chutney, and fresh coconut shavings. This dish came in four sizes: quarter, half, whole, or breast. I opted for the half chicken, and am so pleased that I did because it was delicious. For my glaze, I chose pineapple jerk, the fruity option. There was also the option of spicy classic jerk or creamy coconut jerk. The chicken was sweet, spicy and wonderfully succulent. The rice ‘n’ peas was full of flavour, and I surprised myself by falling in love with the taste. I loved the zestiness of the orange chutney and enjoyed the coleslaw so much that I had to ask for more. I loved the concept of putting poppy seeds in with the carrot, cabbage, and onion, it added an extra level of flavour to this side dish. While I loved the dish, I did end up getting slightly overwhelmed by the spice of the jerk seasoning, which is when Michael offered me a glass of milk, after reassuring me that it happens a lot more than you would think. For his main, the fiance opted for Goat Curry, a dish he first tried when visiting Antigua as a child and fell in love with. 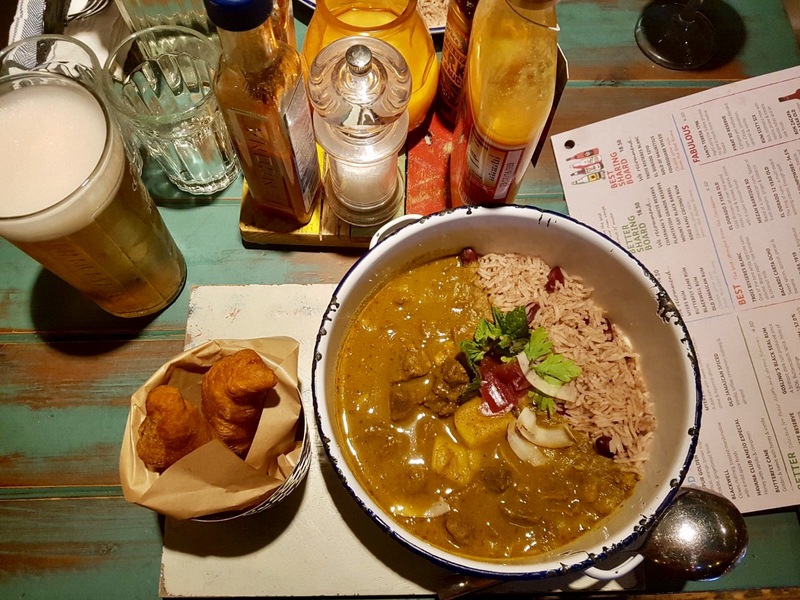 Turtle Bay’s Goat Curry combines marinated, slow-cooked goat meat infused with jerk seasoning, scotch bonnet, citrus juice, and fresh ginger, served with coconut rice ‘n’ peas, onion chutney, and festival dumplings. Meaty, spicy, and packed full of flavour, the dish was delicious. We especially loved the ‘staff secret’ twist that Michael told us about, dipping the dumplings in rum toffee sauce, which we did and loved! Having built his excitement up so much surrounding the dish of his childhood, I was sure that the fiance would be disappointed, but he wasn’t – he loved every part of the dish and couldn’t believe how authentic it tasted! What could be better than grilled pineapple for dessert? 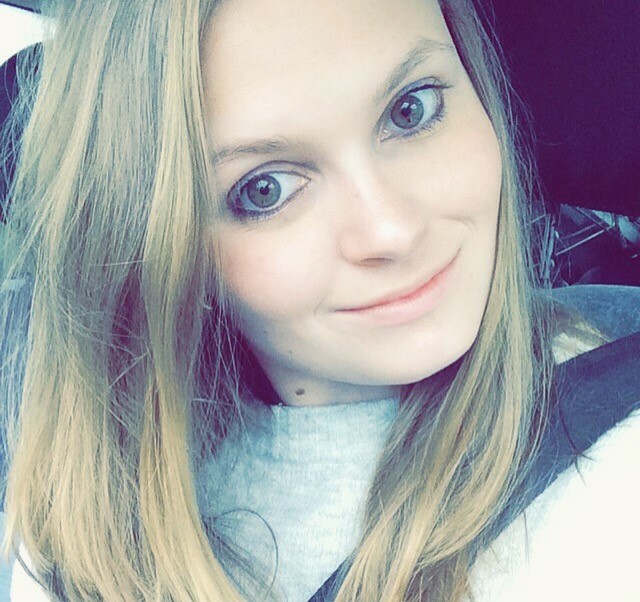 After his main, the fiance was too full up for dessert, so I decided to go it alone. After all, everyone knows that pudding is the best part of the meal. Being quite full up, I wasn’t too keen to have anything too filling, despite the fact that both the Passion Pie and Spiced Rum and Chocolate Pot were calling my name. So I opted for Fresh BBQ Pineapple, and I was so glad that I did. 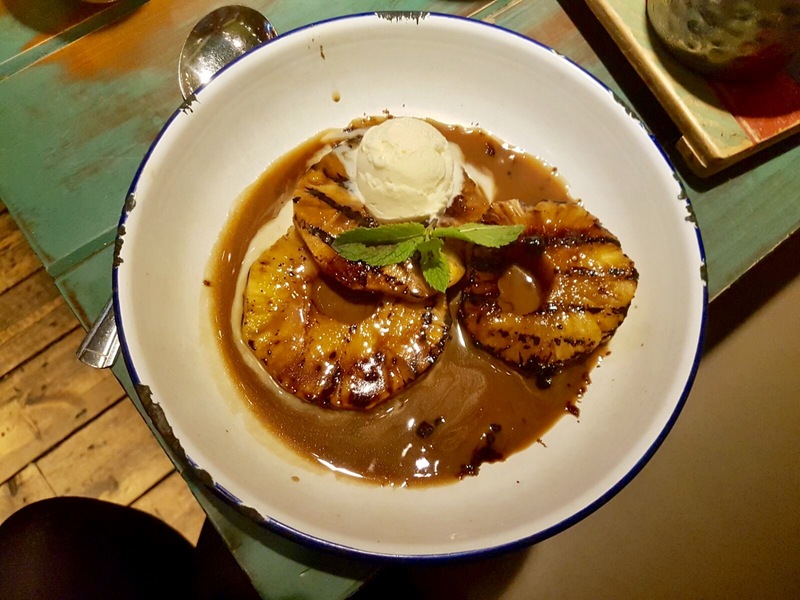 The caramelised pineapple was served with a rum sauce and coconut ice cream, and it was incredible. It was wonderfully sweet and refreshing, and the perfect way to end such an amazing meal. Once I’d finished my dessert, with a little help from the fiance, Michael bought over the the rum menu and asked us each to pick a rum to try. He went through each part of the menu, asked us what rums we liked, and then recommended certain ones depending on our tastes. 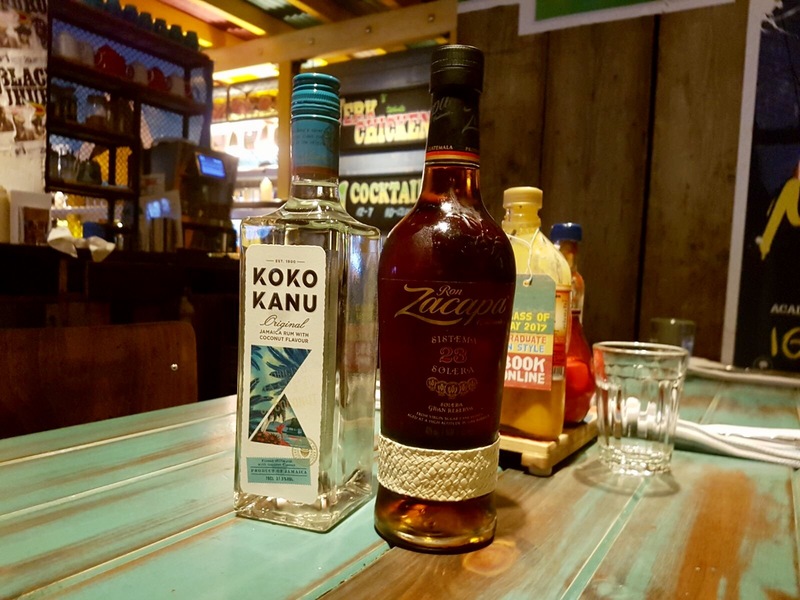 He explained that there were four rum types: good, better, best, and fabulous, with each option having a range of different rum flavours on offer. As I love coconut, I chose the Trois Rivieres Blanc, a white rum flavoured with coconut, banana, and sugar. I was served this with a glass of pineapple juice. The rum was so sweet and fruity, I absolutely loved it. The fiance opted to try one of the many spiced rums. He said it was smooth and sweet and had a strong kick to it. He loved the spicy taste and hit it created. 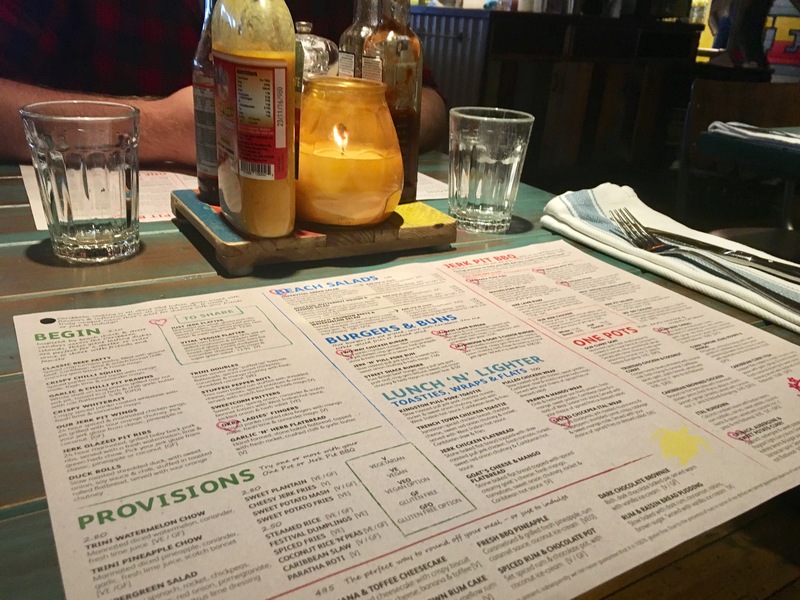 The fiance and I loved eating (and drinking) at Turtle Bay in Cheltenham. The restaurant was incredibly authentic, so much so it felt like being on holiday in the Caribbean. The service was incredible, both Michael and Wesley were so friendly and accommodating, especially when it came to my nut allergy. And the food was delicious – it was so much nicer than I ever imagined it would be, which is always good. 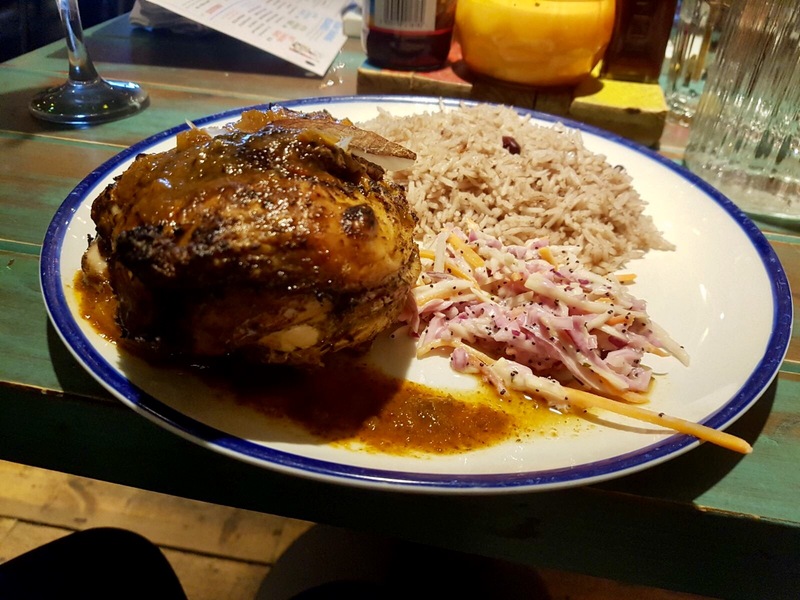 *This post was created in collaboration with Turtle Bay, however, all opinions were my own.